The homemade lemonade recipes featured on this page are from the days of the old time pharmacy soda fountain. 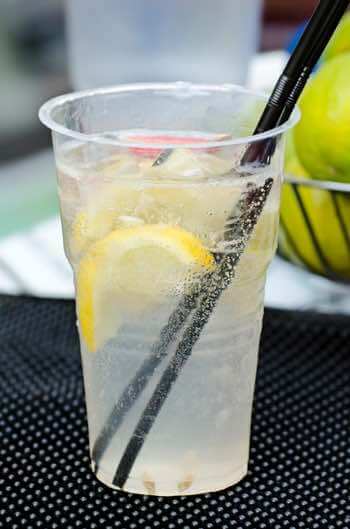 Some lemonade drinks are made in the basic style while others are made fancier, calling for flavored fountain syrups and carbonated water (soda water). You are sure to find a refreshing beverage that perfectly suits your taste. Old fashioned lemonade is still a great favorite with many individuals. To make it at the fountain counter place 2 tablespoonfuls of powdered sugar in a 12-ounce glass one-half full of crushed ice. Now cut a lemon in two, slice each section in two or three pieces, add the juice of the lemon and fill the glass with plain ice-cold water. Shake throughly, pour from shaker into glass, and serve with straws. It should be observed that some patrons object to a too great abundance of ice. Juice of 1 lemon, 1 tablespoonful powdered sugar, 4 ounces soda water (seltzer water), 2 ounces shaved ice. Stir vigorously in a shaker with a spoon, strain into a 12-ounce glass, fill the glass with seltzer (soda) water and stir with a spoon. Make a soda lemonade (see above homemade lemonade recipe), filling the glass to within about an inch of the top. Mix and decorate with lemon and orange slices, pour on top enough to fill the glass with the desired grape juice, and serve without further mixing, with straws. Make a lemonade in the regular manner and pour in a teaspoonful of raspberry syrup (or strawberry syrup, if you'd like a strawberry lemonade), which will go to the bottom of the glass. Now, carefully pour on the top the same amount of grape juice without stirring. A piece of pineapple, orange, or other fruit may be added to decorate the drink. The drink may also be made with the glass half full of shaved ice and the fruit on top. Serve with straws. Juice of 1 lemon, 1-1/2 ounces pineapple syrup. Place in a 12-ounce glass, fill glass with carbonated water, coarse stream, add a slice of pineapple and a ladleful of crushed pineapple, and serve with a spoon and straws. Price—10 or 12 ounces, 15 cents. Take a good-size watermelon, hollow out the inside, first cutting a small slice from the narrow end to act as a lid or cover, place in a pan on the counter and surround with shaved or cracked ice; then fill with lemonade, adding enough extract of Jamaica ginger to suite the taste. Juice of 1 lemon, 2 tablespoons powdered sugar, 1/2 ounce grape juice, 1/2 ounce wine (claret), small scoop shaved ice, plain water to fill glass; shake, put in 12-ounce lemonade glass; finish with a slice of orange and a cherry; serve with spoon and straws. 3 gallons water, 4 dozen lemons, 3-1/2 ounces citric acid, 20 pounds granulated sugar. Mix and stir adding the paste made from 4 ounces of granulated sugar and the grated rind of 4 of the lemons. This formula is recommended. Juice of 1/2 lemon, 1-1/2 ounces orange syrup, 2 ounces grape juice, sufficient cracked ice, carbonated water to fill glass. Shake and serve in a tall glass, without straining. Top off with a slice each of orange and pineapple. The juice of four lemons, twelve tablespoons sugar, eight cups water, one cup maraschino syrup, and a few cherries. 2 ounces cherry syrup, 1/2 glass cracked ice, juice of 1/4 lemon, sufficient plain water. Mix well and top with orange and cherry. Price—10 ounces, 10 cents. Take 3 tablespoonfuls of bottled or homemade root beer; add 1 lemon sliced and sugar to suit the taste. Place in a gallon jar, add a large lump of ice and fill the jar with water. —Sister Willoughby Felker, Leaf River, Ill.
Grate over enough sugar the peel of half the lemons you intend to use, and squeeze the lemons into it with a squeezer. Then beat up as many eggs as you intend glasses of lemonade. If you are making a quantity, you may take one or two eggs less. Beat up the lemons and the sugar, next add water in proportion, and then shake or beat the whole vigorously for a few seconds. Fill the tumblers half-full of broken ice. Before serving shake again. Lemonades are among the earliest popular beverages. 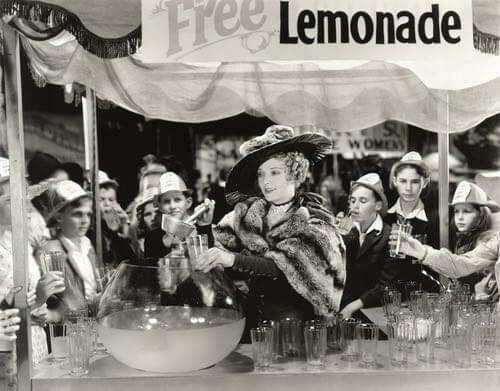 History records that honey-sweetened lemonade was sold by licensed vendors on the streets of Paris as early as 1676, and it was a favorite beverage throughout Europe. 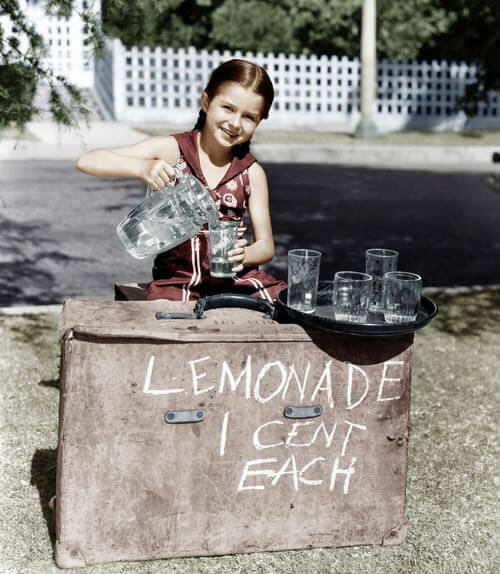 In both Canada and the U.S., lemonade was the most popular refreshment in the early 1800s. Homemade lemonade recipes such as those above were common. Not only were lemonade beverages served in homes, but it was the preferred refreshment at sports events, church picnics, and other public gatherings. In 1838, a French perfume dealer by the name of Eugene Roussel operated a small shop in Philadelphia and sold soda water as a means of extending his trade. Seeking a way to improve the taste of the beverage, he created carbonated lemonade by dissolving sugar in water flavored with lemon juice and then adding it to soda water. Roussel is credited with being the first to discover that sweetened fruit flavorings could only be added to carbonated water as concentrated syrups during bottling to avoid lessening the carbonation. This discovery also avoided unwanted fermentation, as the boiling of the syrup killed any wild yeast spores or bacteria present in the fruit juice. Therefore, Roussel's "Lemon Soda" became the first fruit-flavored soft drink to be bottled and sold in North America. Carbonated water (soda water) can be found for sale in the soft drink section of most food and convenience stores. Make your beverages with flavored syrup concentrates from The Prairie Moon Company. Choose from over 50 old fashioned soft drink flavors including Root Beer, Sarsaparilla, and Cola. Simply add water and your own sugar or sweetener. Prairie Moon offers low cost shipping to U.S. and Canadian customers. I highly recommend them! Disclosure: This is an affiliate link, which means that if you purchase a Prairie Moon product through this link, I receive a small compensation to help support this site — at no extra cost to you.